Wild: Parasaurolophus amphibio has some of the more interesting adaptions of all Creatures I’ve seen on the Island. Like all parasaur it has a signature head ridge. Very docile at first, I’ve often been able to approach them without complaint. 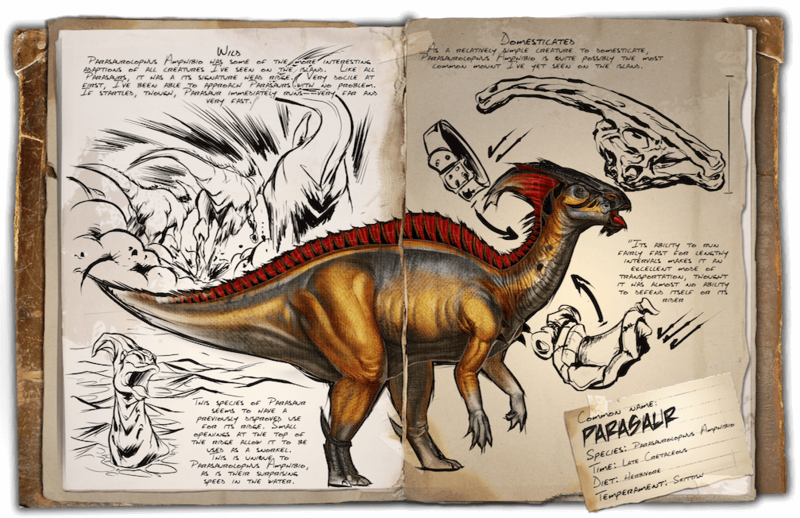 If startled, however, the Parasaur immediately runs – very far and very fast. Domesticated: As a relatively simple creature to domesticate, Parasaurolophus amphibio is one of the most common mounts I’ve yet seen on the island. Its ability to run fairly fast for lengthy intervals makes it a solid mode of medium-range transportation, though it has almost no ability to defend itself or its rider. Known Information: This species of parasaur seems to have a previously “disproved” use for its ridge. Small openings at the top of the ridge allow it to be used as a snorkel. This is unique to Parasaurolophus amphibio, as is their surprising speed in the water.